We’re not like most schools. We can, in fact, boast three libraries in our school for children and families to access. Our Audio Library (we have a very well stocked audio book library which can be accessed from our library as well as any computer around school). 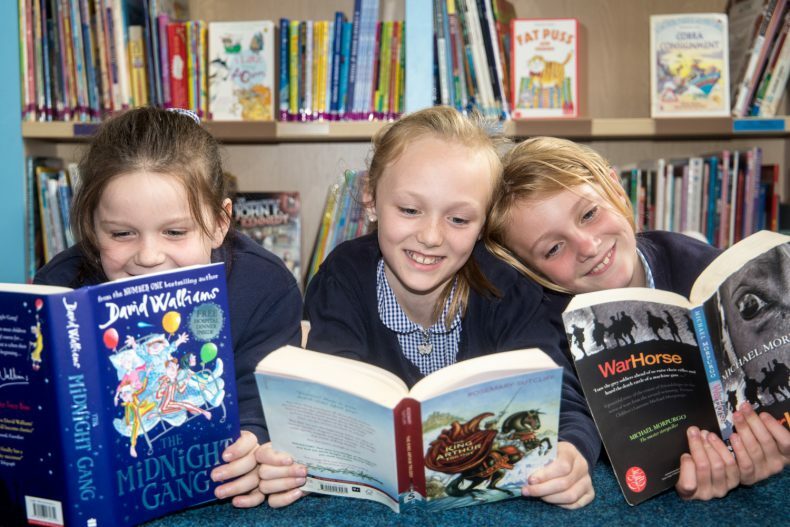 At Allanson Street Primary School, we believe we have the best stocked and usable library in the whole of St Helens. In fact, we’d put our library up against any other schools’ in Merseyside, we’re that proud of it! We have sections on adventure/mystery, humour, friendships, fantasy, horror and sport. We also have shelves dedicated to ‘Popular Authors’ and ‘Popular Series’ which are organised by key stage for ‘infants’, ‘lower juniors’ and ‘upper juniors’. We also have a special section dedicated to ‘classic stories and historical authors’. We have an enormous stock of non-fiction books spanning subjects such as science, history, geography, art, music, PE, religion and PHSE. We also have special reading crates dedicated to ‘English/EAL’, ‘mathematics’, ‘encyclopedias’ and ‘general knowledge’. Every year group has 4 topic crates (one history, one geography and two for science) that contain a mixture of non-fiction and fiction books that match the class topics throughout the year. We also have a French crate for the whole school to encourage and support our children in learning their modern foreign language. How do we stock our library? We want books and we want lots of them! We use a generous amount of our school’s budget to help keep our library generously stocked. We do this because we place huge value on having an inviting and ‘current’ library for our children to enjoy. We also accept high quality donations from staff. It’s not unusual for staff members to bring donations of books into school from home, family members or friends. We also run a successful community donation scheme that utilises social media. It always amazes us by how many of the books, that are donated, are such high quality! Quite often, they’re better than the books we buy and they fly off the shelves! Our library is open every afternoon for classes to visit. Each class has a weekly timetabled slot. The library is also open every lunchtime for children to drop in. Not only that but our library opens every day Monday-Friday after school for families to come in and enjoy books together! We don’t just have a library full of books… We have a library full of knowledge, dreams and wonder! November 2017: We raised an outstanding £1222.00 for our school library. This has been transformed into £2000.00 by Usborne Books and we have bought an truely remarkable selection of books for our library. Can we please take this opportunity to thank all families who participated so enthusiastically in our sponsored ‘Reading Challenge’. We look forward to your children being able to visit our library and borrow these lovely books. We know you will love sharing them together. November 2017: Our whole school Reading Challenge has raised a huge amount so far! We are collecting final sponsors during this week and will be placing our order for all those lovely new library books over the weekend. We will reveal the final amount raised on Friday. Can we take this opportunity to thank everybody for participating and supporting our school with such a generous amount of spirit and enthusiasm. Well done families! October 2017: The fiction section of our library has had an overhaul recently and we have invested a lot of time in reorganising our shelves to make them even more accessible for our children. We have introduced lots of new and exciting sections for our children to explore. They are: ‘Mixed Reads’, ‘Junior Reads’, ‘Popular Authors’ and ‘Popular Series’. We have also introduced some ‘Specialist Reading Crates’ for ‘English & EAL’, ‘Mathematics’, Encyclopedias’, ‘General Knowledge’. There is also a dedicated crate for ‘Classic Stories & Historical Authors’. September 2017: All children will receive new copies of their e-book log-in details over the coming weeks. These are re-issues so if you still have your details from before the summer holidays, these will still work and allow you access to over 1000 free e-books via the Reading Cloud. Parents of children in Year 3 will recieve their details in our Parents’ Transition meeting this coming Friday (8th September). You can access the Reading Cloud by visiting www.readingcloud.net Remember, your childs 3/4 digit code acts as your childs username and password. That is all you need!